If you're reading this, you're amongst the first to see our starter issue. Even though we've been doing this for a long time, it's taken alot of positive encouragement to get way out there and take the internet for a spin. A direct thank you to those who have encouraged us. You know who you are. Most of you know what I'm talking about (doing something daring) and have just taken the plunge with a fixer-upper. Others have a pristine vehicle you've enjoyed for years. Either way it'll be fun for us to take care of your piece of automotive history. We're looking forward to it. We want to welcome you to Tonka Jeep Limited. And hope we get to know you and your vehicle a little bit better. Take a look around. We like to keep it simple but plan to enhance this site with new features in do time. If you have suggestions, we're all ears. They are everywhere, I mean everywhere. Within the past few weeks on my commute back home, I saw a restored 1950 Willys pick-up and just a day later, an entire family of five tooling around a restored 2A. Last summer, while driving my 1943 Jeep to the post office and was approached by a guy claiming he had an original jack for my ride. Oh sure I thought, every day a quick jaunt into town will provide an encounter with a man claiming to have one of the harder to find pieces of Jeep jewelry. After reluctantly going to his home, fully expecting a bright green Nissan Stanza tire jack. To my surprise -- there it was -- with correct O.D. chipped paint and in fully working order. Funny thing, I drive past this place all the time, only to find out it was sourced locally at a garage sale. We've all traveled great distances to obtain vehicles and parts. But sometimes they are there in front of you. We'll talk more down the road. I was surprised and honored to appear on the MV cover but there are two backstories that a very are bittersweet for me. The shot was taken at Kevin Kronlund's annual military vehicle and warbirds fly-in in northwest Wisconsin. Kevin's collection of vintage military vehicles (Jeeps to many to count) was the largest in the world and he graciously shared his passion with friends and stranger alike. As many already know, a few weeks after this was shot was taken, Kevin tragically lost his life in a work accident. He was a good friend and great guy. I miss him and his events. The second story too, is of friendships which spring up from this hobby and continue to this day. 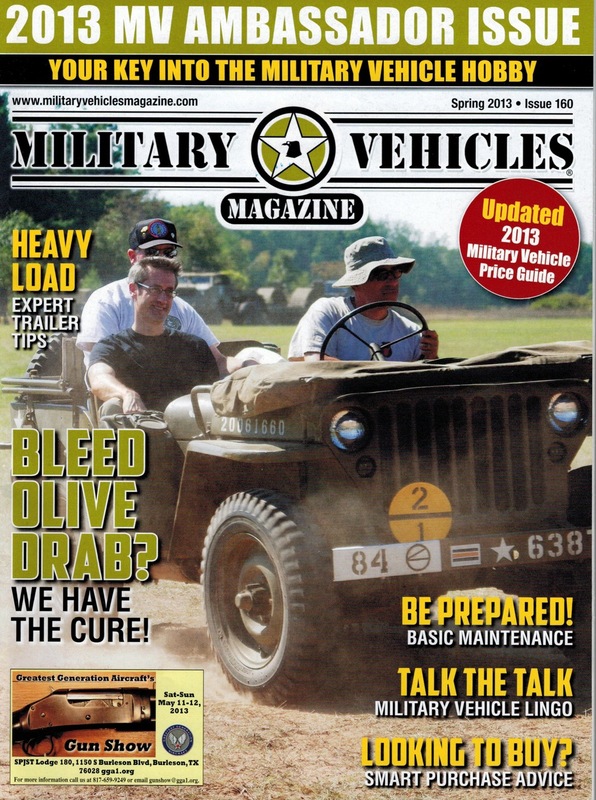 The guy in the passenger seat is my long time friend and fellow vintage Jeep owner, Rob L. He and I met at Louie's Willys Minneapolis almost twenty years ago, while standing at the counter. We still get together regularly for coffee and to talk some shop but more often talk about work and family. This hobby has created many lasting friendships with the nicest and most generous people I have met in my life. And in conclusion, those relationships are more special than appearing on any magazine cover. Here's to seeing more friends on the road and off the trails soon.